Cold Dude Computers: How to get a Purple Grape Costume! 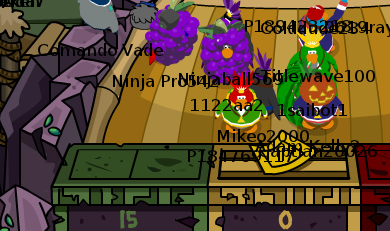 How to get a Purple Grape Costume! Recently I have realized that you can get the Purple Grape Costume very easily! The first step to getting it involves you going to the Snow Forts. You have to go up one of the 3 flights of stairs. 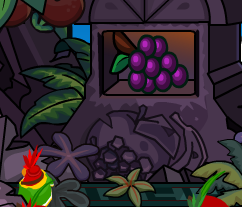 Once you are up one of them, keep throwing fruit into the 'lava' and when it drains out he will give you a background. You need to click on the paper. Go up the other two flights of stairs and do the same. On the last flight on stairs when you have done it, the last piece of paper will appear and the bars will rise where the grapes are. You need to claim the last piece of paper before the bars will lift and you can claim the prize. 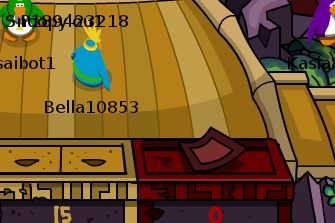 Do you think this is a cool costume for non-members and members? Leave a comment and let us know!